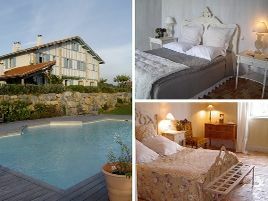 Perched on the hillside on the outskirts of Biarritz, between the golf course and the sea, an authentic basque farmhouse. Spacious rooms, attractively decorated with whitewashed walls, exposed beams and antique furniture. Breakfast with homemade jams and cakes is served on the large terrace overlooking the Rhune. For fun and relaxation, a large swimming pool, surrounded by a magnificent garden. Warm welcome..
2 suites and 3 rooms with bath or shower, WC and TV. From 98 to 181 euros (1 pers. ), 110 to 192 euros (2 pers.). Extra bed 25 euros. Baby equipment, babysitting. For teenagers: pétanque, swimming pool.